Five straight draws are threatening to end Wales’s World Cup qualifying hopes, but the Dragons hope that the game against fourth-placed Austria will prove the turning point. 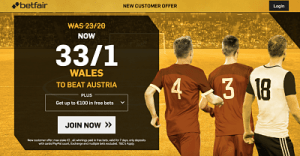 Das Team have also failed to impress in the current campaign and with Gareth Bale and Aaron Ramsey returning for the hosts, you will be glad to hear that new Betfair customers who register via this link are quoted 33/1 special price on home win. You also need to enter promo code ZFBDDV during the registration process and place a £1 bet on the enhanced price. All winnings are paid as free bets. Terms and conditions apply.